This Cambro 66PP190 1/6 size 6" deep translucent food pan is the perfect economical option for cold food storage. Its translucent polypropylene design provides content visibility and high chemical resistance atop your sandwich / salad preparation refrigerator, or within your Cambro food pan carriers. Fantastic food pan! I love that these are clear so our staff can see right into them when they are in the fridge without having to pull out containers. They are easy to wash, withstand dishwashers, and don't warp or stain even with hot foods. Definitely will be purchasing more! These are very durable and convenient for use in our commercial kitchen. We use them to store chopped veggies etc. Plastic wrap clings very well to tightly seal the top. These have held up well to at least 3 years of use. These containers are great because of the airtight snapping lid. We have saved so much Saran Wrap by just snapping on a lid at closing. A really nice food pan, especially for the cost. You can clearly see the product through the translucent walls and the pan is deep enough to hold plenty of product. Great cambro product. I use these for all my pizza toppings and they have held up great. Hot items, cold items they hold really well even with the extreme temperature differences. They fit right into our sandwich table just like the ones from the manufacturer. We are happy with the purchase and would buy them again. Multiple uses in the kitchen for sure! We use it to store pasta salad, fruit salad, chicken salad, etc. They are very sturdy containers. I have never had one crack on me before. We use them all day long! I love the fact that they are clear because I can see whats inside wither its from the top angle, bottom, or side! these milky white containers are a bit cheaper but just as sturdy and durable as the clear cambro pans. DO not hesitate to buy these. This is a great food pan. It is strong and super durable. I like that it is translucent and I am able to see the contents inside. I recommend any restaurant save there money and buy these pans. They will last through the abuse of a busy restaurant. The plastic is a little softer but it allows it to not break if dropped. This clear food pan is the perfect size for our sandwich cart. It's easy to wash and has held up with hot and cold foods. A better price than the clear ones but do the same job. I am very happy with these, they look great and are made well. Very good container for the money. The plastic is high quality and does not scratch. It cleans easy, and is very durable. Good product, we would buy it again. Cambro is the best. They hold up to all the temps I put them under. I love having the room to use the full 6" deep pans. price is so much cheaper then the retail store, i would totally buy it again and would also recommend to my friends that own a business. We use these to measure out ingredients. Lightweight, durable and machine washable, all makes these little tubs a favorite for weighing and temporarily storing smaller amounts. This product works exceptionally well in both our sandwich and pizza bars. Exceeded my expectations will definitely reorder this product in the future. The price was a lot lower on this site than through the numerous other vendors we use. We use a LOT of these pans in our restaurants for cold lines, and we have a number of different brands floating around, but we have started to only buy this Cambro product because of how well the locking/seal lids work. These have been very useful in our pizza house. We use them on the bar as well as under the bar to store all of our pizza toppings. You can never have enough! I like this translucent one better than the clear ones I bought. The plastic seems more durable and not as brittle as some others I have purchased. Great product. The semi rigid construction of these plastic containers lends itself not to crack. All the other transparent, hard plastic containers always end up cracking while these hold up to repeated drops. Cambro is the best brand for any type of food pan or storage container. These pans are high quality and will not break or crack if you drop them. These are a great value and very durable. Granted they don't feel as "high end" as the completely clear plastic ones, but I've also never had the corners chip on me with these. These Cambro 1/6 size pans are very durable and the price cannot be beat. I shop around and the Webstaurant prices and service can't be beat. I am a klutz, I drop things constantly. These have a little "give" to them so that they do not shatter when you drop them. Love that. I love this brand and have been using them for 6 years + now. Never breaks and easy to clean and store. Very happy for the quality. these cambro 1/6 pans are at a great value price. we use them for cold prep products in our cold wells. at this price you cant go wrong. Great food pans. These are so strong and sturdy. I purchased them in many sizes and also the lids that go with them. They hold wet and dry ingredients. I will be buying more for my restaurant. These bins look nice and clean easy. They feel very durable and I like that they are not clear plastic showing the bottom of the salad bar as the food level goes down. The cost is also very reasonable. A perfect size food pan for sandwich prep stations. Non staining, and easy to clean. 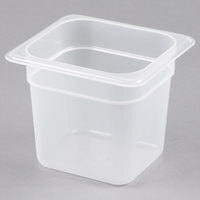 These containers have stood up to countless high temp washes with no cracks. The translucent food pan is great way to get the benefit of the storage for a economic price. We love these pans and use them for everything.